Any Book, Every Day with the Bibliophiles Club. An uncommonly good way to save on books. $19.95 / year - BUY NOW Instant 10% savings! The Bibliophiles Club is an annual membership. Join today and receive 10% off every purchase, up to $25 savings per purchase. Purchase your Bibliophiles Club membership today and receive instant savings on every item in your cart. After purchasing your Bibliophiles Club membership, you will receive a membership number, which will automatically be inserted into the promo code box in your cart anytime you are logged into your Biblio account! Each time you return to make a purchase, log in to your Biblio account and your Promo Code will be waiting in your cart. Your 10% discount will be automatically applied. 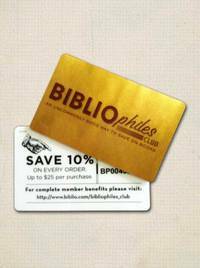 Your Bibliophiles Club Membership entitles you to a 10% discount on any eligible purchase on Biblio.com up to a maximum discount of $25.00 per order. Before placing each order you must log in to the Biblio.com account you used when claiming your Bibliophiles Club Membership. When placing your order, confirm that your Bibliophiles Club Membership code is in the Promo Code box on the shopping cart page. The Bibliophiles Club discount applies to the item price only and does not apply to shipping or other charges. The discount cannot be combined with other discounts coupons or promotions and cannot be used toward the purchase of gift certificates. The discount may not be used for multiple orders for the same item. Biblio reserves the right to reverse any discounts that do not meet these terms and conditions and/or cancel and refund any membership at its sole discretion. Your Bibliophiles Club Membership Fee ($19.95 USD) is non-refundable and is not transferable. Your membership term lasts one year and will auto renew one year from the date of purchase. Prior to the renewal date Biblio will notify you via email of the pending renewal and the membership renewal. You may opt out of the auto-renewal at any time. Once you opt out your membership will expire at the end of the current term. If you do not opt out, then on the renewal date your credit card will be charged the amount of the membership renewal.